Prepare to stand out from the crowd this Easter with ruffles hitting the runway as the outlandish trend for Spring/Summer '17. With everyone from Alexander McQueen to Erdem featuring them in their collections, get gutsy and wear this on-trend look. No more hiding behind piles of Easter eggs for us! Almost with Easter in mind, designers were all over the modern ruffle for their Spring/Summer 2017 collections, with similar looks quickly hitting the high street shops. A versatile trend, we are finding many ways to combine a ruffle or two into any look, bringing life and fun to spring mornings. A wave of ruffles continued in Paris as Ukrainian designer Julie Paskal channeled "goa trance" at her second showing in the fashion capital, teaming Spring's prevailing trend of ruffles with bright neons, creating a "freedom" that "reunites beauty, wisdom and love." 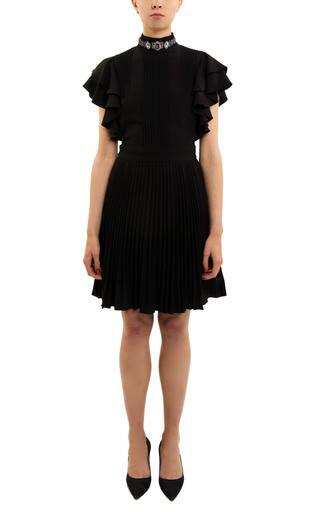 However you take on the frills of Spring, ruffles are definitely a trend to incorporate into your Easter wardrobe. Browse the Ruffle Edit for inspiration.